Q. Do you have a restaurant for lunch / dinner? Only breakfast is served in the Great Room. There are many dining options within walking distance and “dine in” options for delivery. Q. What credit cards does the hotel accept? Holiday Inn Express Krabi Ao Nang Beach accepts the following credit cards: Master Card, Visa Card, American Express and Union Pay. Q. Does the hotel have kids pool? Kids are welcome to use the pool but must be supervised by adult at all times. Q. Where is the hotel located? Q. What is the check-in / check-out time? Check in from 3pm. and check out at 12pm. Q. How to make a reservation? Book you stay at Holiday Inn Express Krabi Ao Nang Beach by clicking this link. Q. How many people can stay in one room? A maximum of 3 guests are permitted per room. If there is more than 2 adults in a room, extra bed fee will be applied. Q. Does the room have a tea / coffee maker? All rooms at Holiday Inn Express Krabi Ao Nang Beach come with complimentary tea and coffee amenities. Q. Do you have in-room minibar? A mini fridge is provided for your convenience, but it is not stocked. Q. Do you allow smoking in the rooms? Q. How do I get to Krabi? Q. Is there a parking lot for guests of the hotel? Yes, there is free parking for guests at Holiday Inn Express Krabi Ao Nang Beach. The parking lot is attended and is large enough for many tour buses as well. Q. How long do I take from Krabi Town to the hotel? 20 minutes by car. Local 'Song Taew' shuttle also available to and from the hotel. Q. How long do I take from Krabi International Airport to the hotel? Q. Is there a shopping area near the hotel? Holiday Beach Walk Plaza is only a few steps away. 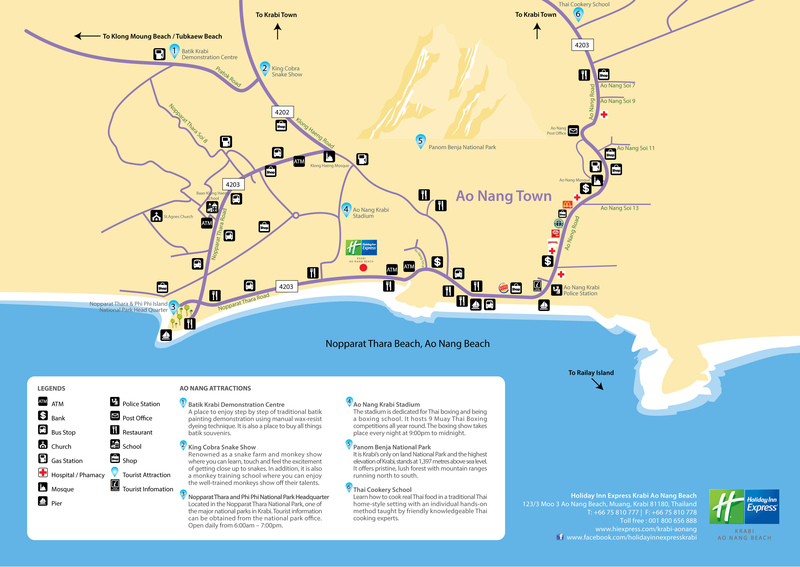 You can walk into Ao Nang Town within 10 minutes. Krabi Town is only 20 minute drive by taxi. Q. Where is breakfast served and at what time? Free Express Breakfast or Grab & Go is available at “Great Room” from 06.30 – 10.30 am.